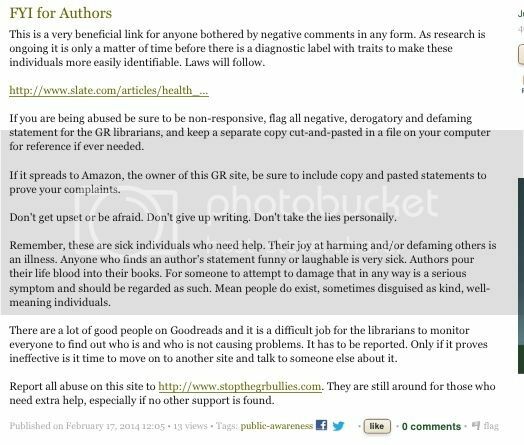 Goodreads Author Guidelines Are Not Just Suggestions. Or Are They? So, here I am minding my business this morning, when Ms. Judith-Victoria Douglas pops up on a feedback thread about reviews I'd been participating in. She decided it was her duty to spread a PSA about trolls and the illness that is trolling. Of course, her example of this tragic illness was a one-star review of one of her books. I know, you've seen this before. I don't usually do my own posts about BBA's, I rarely have the time and they get enough attention as it is, but I'm doing one for Ms. Douglas. Not just because of her ridiculous and inappropriate behavior, but because I'm getting sick of seeing how many authors have so little understanding of the Author Guidelines or how goodreads works, in general. Here is Ms. Douglas's first post in feedback. Warning: These posts are very poorly written and slightly incoherent. I know, you've seen this, too. Bear with me, please. Naturally, myself and others pointed out that what she was doing was against the sites TOS and that we'd reported her blog post linking to a users review. Here is the blog post in question. Everything that follows after is pretty typical. I'm just going to C&P her comments so you get the gist. Judith-Victoria wrote: "No nasty names mentioned. Only a link for readers to know the current psychological study on those who troll. To be called a troll would be bad enough, but to have a psychological review of those who do it called serious names is for the protection of the public. If you don't want to be put in that category, then don't troll. It's really not as much fun for the rest of us as it is for those who do it. If GR curtails my activity and not yours, then it will prove some of my opinions of those managing the site. Some were the very culprits in the past, but still linger. This was only a matter of time in coming." 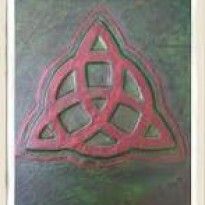 Judith-Victoria wrote: "An honest review, even a bad one that tells why it was not liked and gives some suggestions would be welcome. Thank you for the warning. 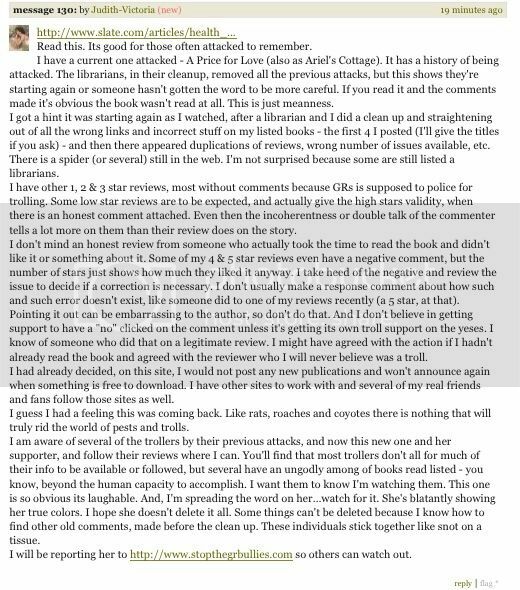 You are such a sweet person for caring so much about authors who point out personal attacks masked as a review. It makes it a dishonest review and shows the reviewer for what she is. I don't have to call anyone a name. The tags are in reference to the article. Since I am in the psychological field I am only one who has suggested that internet trolling be added to the DSM as a personality disorder. I think the article suggests that further research will prove that it is. I'm only warning the public and anyone who thinks personal attacks on others, in the guise of a work (be it book or other types) are fun. Best of luck to you." Then the obligatory ranting on Facebook. She also seems to think this behavior is a great marketing plan for her books. So, not so much a PSA as a temper tantrum by, yet another, unprofessional author. 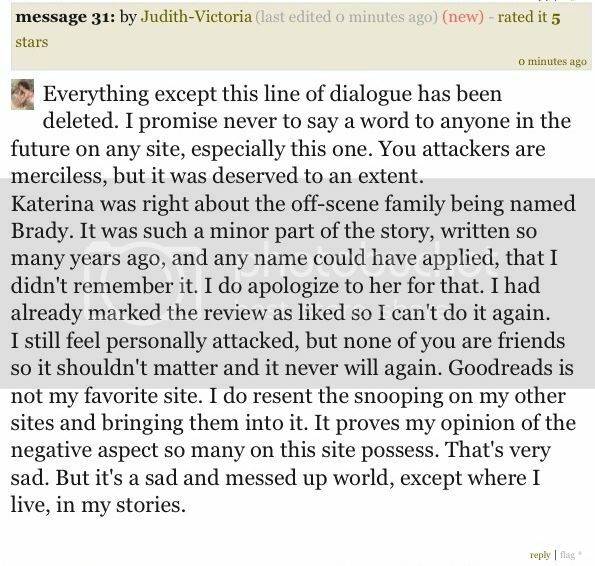 Now, either GRs deleted her blog post or she deleted it herself, doesn't really matter, so she put up another one, minus the link and names of GRs users and double on the cray-cray to make up for the loss. This is what got me, though. I mean, they all follow the same BBA playbook, she's certainly not doing anything new, right? Either having no idea how GRs works or thinking they're above reproach because of their author status, seems to be a common theme among these misbehaving authors. As evidenced below in Ms. Douglas latest blog where she advises anyone who doesn't like negative comments to report everything to the GRs LIBRARIANS! There's been some discussion on a feedback about how GRs plans on preventing these types of situations from happening in the future. Anyone who's interested or has any ideas should definitely go put in their two cents or start a new topic. ETA: Ms. Douglas has apologized for her mistake in assuming the reviewer was a psycopath with troll disease. But it's still everyone's else's fault for listening to her rants and it's people like those that make the site so awful. Not the authors running around name-calling and making accusations. No, of course not.